Thanks to the great work of Tom Shieber, a more definitive date has been determined for Babe Ruth’s home run in the classic film Speedy (see here for video). In a post over four years ago, I declared the mystery solved, having deduced that Harold Lloyd filmed Babe Ruth’s 54th home run in the second game of a double header against the Chicago White Sox on September 18, 1927. However, Shieber has made a more convincing argument that Lloyd never filmed the Bambino at all (or at least didn’t use his own footage of Ruth in Speedy). Rather, Ruth’s trip around the bases almost assuredly seems to be stock footage from the 1926 World Series. You can read below for why I had assumed Lloyd had filmed Ruth at the end of 1927, but perhaps I should have paid more attention to the significant filming delays that Lloyd encountered due to rain. This might have necessitated a short cut, and, thus the need to use stock footage. If so, it stands to reason that only World Series film would be available. For more details about Shieber’s deduction, click the link above. Although the Ruth home run in Speedy has been identified, that still leaves one more mystery…from when is the footage of Ruth striking out? At the risk of making the same mistake twice, if we assume this event was actually filmed by Lloyd (Ruth’s only strike out at home in the 1926 World Series occurred with the bases empty, so it doesn’t seem likely Lloyd would have access to film of another home strikeout if he didn’t shoot it himself), there’s only one possibility: August 31 vs. the Red Sox. In the first inning of that game, Ruth struck out with Earle Combs on third and Mark Koenig on first. I won’t say mystery solved this time, but the events of August 31 fit the fact pattern. Larry Granillo’s (Baseball Prospectus and Wezen-Ball) recent forensic investigation into Ferris Buehler’s whereabouts on his now infamous day off made for one of the more creative and entertaining blog posts in quite some time. For those who missed the piece, Granillo attempted (and succeeded) to determine the date of the game that Buehler attended with his fellow truants by analyzing the footage from WGN that was used in the movie. In addition to being greatly amused by Granillo’s investigation, it got me to thinking about how many other unsolved baseball mysteries remain cloaked in movie clips from years gone by? The list of unidentified baseball references on the silver screen are probably too numerous to count, so let’s start at the beginning by examining one of the first movies to incorporate live baseball action into its script. The movie in question is called Speedy (which will be featured at this year’s Rhode Island International Film Festival in August). Created by renowned silent-era funny man Harold Lloyd, the comedy tells the tale of hapless Harold “Speedy” Swift, whose addiction to the Yankees constantly interferes with his ability to remain employed. During the course of the movie, this compulsion causes Speedy to lose several jobs, including one as a taxi cab driver, but not before having the chance to chauffeur Babe Ruth in a harrowing ride from Manhattan to Yankee Stadium. 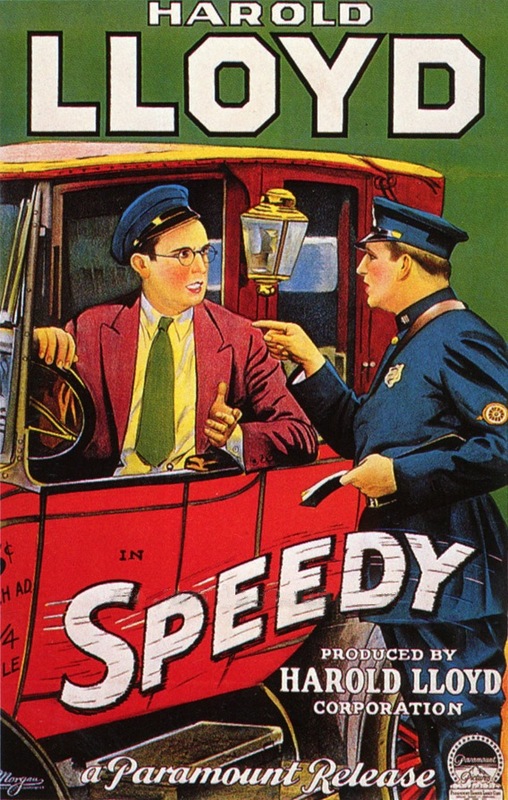 Speedy was Lloyd’s last silent film and resulted in his only Academy Award nomination, but more than anything, it is best remembered today for the spectacular footage filmed in 1927-era New York City. The extensive on-location filming pushed the movie’s price tag toward $1 million, an unheard of figure for the era, but Lloyd’s expense immediately paid off thanks to the buzz his month-long stay in New York created. Over the years, the movie’s archival footage has made it even more valuable as a historical reference. As Speedy whirls around the town, we get detailed glimpses of a city brimming with motor cars, horse-drawn carriages, trolleys, and elevated trains. The movie also includes vivid images of Luna Park in Coney Island, Columbus Circle, the Brooklyn Bridge, Penn Station, the Battery, Times Square, Fifth Avenue, and most importantly to baseball fans, Yankee Stadium, which is where the real point of this exercise begins. The first glimpse of Yankee Stadium occurs early on in the movie (4:32 in the first clip). Unfortunately, the lack of clarity and detail prevents the date of the game from being indentified…at least to this point. In the meantime, we’re treated to several amusing scenes as Speedy endeavors to perform his duties while keeping tabs on the ongoing game via telephone calls to Yankee Stadium and a visit to a public scoreboard outside the local sporting goods store (which we’ll examine later). From a baseball standpoint, the highlight of the movie is the approximately five-minute segment featuring Babe Ruth (2:43 to 8:00 in the second clip). A couple of days after being fired from his job as a soda jerk, Speedy winds up being hired to drive a cab. 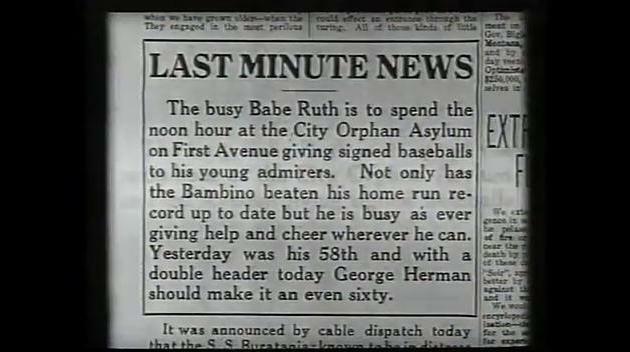 Using a newspaper story as a tip, he arranges to meet Ruth outside a First Avenue orphanage, where the Babe is handing out signed baseballs to the children. Apparently behind schedule, Ruth departs the orphanage in a rush to make that afternoon’s game, so he hires Speedy to give him a ride. Despite the hair-raising journey to the Bronx, Ruth invites Speedy to attend the game, which the avid Yankee fan can’t resist. Of course, this indiscretion costs Speedy another job, but at least he gets to see the Bambino belt a long homerun. Now that the scene has been set, it’s time for the mystery: which of Ruth’s homers did Lloyd film and what game did Speedy attend? The smoking gun in the second video clip is the homerun that the Sultan Swat belts into the right field stands (7:25). Of course, being 1927, that wasn’t such a rare event. So, in order to pinpoint which of Ruth’s 60 homers Lloyd caught on film, we’ll need to do some more detective work. The first step to indentifying the correct game was establishing a timeline for when Lloyd was filming in New York. On September 2, 1927, the Pittsburgh Press’ Dan Thomas wrote that “Harold Lloyd left the other day for New York, where he’ll use the Yankee stadium for some baseball shots”. This is corroborated by a United Press story on September 10, which details Lloyds “recent” arrival in the city with “two freight cars of scenery”. The UP story also talks about Lloyd losing $3,000-$4,000 because rain delayed filming for a week. So, although we can’t pinpoint the exact date of his arrival, we can safely assume that the earliest Lloyd could have shot footage at Yankee Stadium was mid-September, but certainly no earlier than August 31 (the Yankees had been on a road trip since August 9 before returning home to play one game against the Red Sox). Finally, thanks to a report in The Border Cities Star, we also know that Lloyd packed up his footage and returned to Hollywood on October 21, which is convenient because that takes us well past the World Series’ conclusion on October 8. Now that we have a set of possible dates, we can return to the homerun. By narrowing the range from August 31 to October 8, we are left with 13 home dates (see chart below) on which Ruth homered. Just before Ruth homers in the movie, we are treated to footage of a near wild pitch in which a runner can be seen retreating back to third base. Continuing with the process of elimination, we can now toss out all games in which Ruth only had one RBI. That reduces the list down to seven, but to make further progress, we must return to the film. Another solid clue comes from watching the pitcher, who is clearly right handed. In fact, as Ruth makes his tour around the bases, we can also ascertain that the first baseman is a left hander (and all other infielders and the catcher are right handed). As a result, we can exclude the games on September 27 and September 30 because Ruth homered off two lefties: Lefty Grove and Tom Zachary, respectively. Furthermore, both World Series games as well as the September 13 tilt can be thrown out because they featured right handed first basemen (Joe Harris and George Burns, respectively). With those five games removed, the list of possibilities is now whittled down to three. The easiest game to eliminate from the final three is the September 22 victory over the Tigers because Ruth’s homerun was a walk-off. In the film, however, not only do the fielders remain at their positions, but Lou Gehrig approaches the plate to take his next at bat. Obviously, none of those things would have occurred after a game winner. Eliminating the contest on September 29 isn’t as easy, however. It meets all of the qualifications previously cited, but there are a couple of additional points that make it an unlikely fit. In the game against the Senators, Ruth belted two homeruns, one solo and one grand slam (the latter his record trying 59th). Although the movie makes it seem as if there is only a man on third, we can’t be certain other runners weren’t on base. Luckily, an Associated Press account of the game offers two more helpful clues. The first is an estimated attendance of 5,000, which doesn’t seem to jibe with the crowded ballpark that appears earlier in the movie. Secondly, the report clearly states that Gehrig was the first to congratulate Ruth on his achievement (in fact, the headline explicitly reads “Gehrig First To Congratulate Bambino”), but in the movie, it’s the bat boy who first shakes Ruth’s hand. In fact, Gehrig doesn’t even take a step toward the Bambino. On September 18, Babe Ruth hit a two-run homer against the right handed Ted Lyons. Newspaper accounts place Mark Koenig “on base” and the box score confirms that all of the fielders had their gloves on the correct hand. What’s more, the New York Times’ estimated the crowd at 45,000, a figure much more consistent with the video evidence, and the tepid response from Gehrig is more befitting a homerun that didn’t tie a record. Mystery solved! With almost completely certainty, we can now say that on September 18, 1927, Harold Lloyd filmed Babe Ruth’s 54th homerun in the second game of a double header against the Chicago White Sox. However, we’ve only solved half the equation. Although we know what game Lloyd attended, was Speedy there as well? Let’s hark back to the Score Board scene mentioned earlier (9:38 in clip 1 and in the picture below). According to the line score, the Yankees are in fact playing the White Sox. However, the lineups posted do not match any of the games played between the two teams in 1927. In fact, they don’t match the only two games in which the listed pitchers (Herb Pennock and Ted Blankenship) both appeared: May 13, 1924 and June 9, 1927. As a result, the information provided in the scene is of no help to us. The movie provides two final clues as to the intended date of the game in the movie, but unfortunately, they conflict. 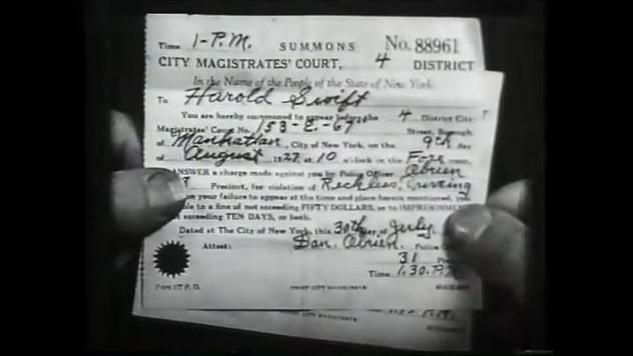 The first is offered just before Speedy enters Yankee Stadium to escape a third traffic ticket from an awaiting officer. When Speedy looks down at one of two summons he has already received, the issue date of July 30 is plain to see. The Yankees did play the Indians in the Bronx on that afternoon, but alas, the Babe did not hit a homerun. Finally, just before Speedy picks up Ruth in his cab, he reads an article that says “Yesterday was his 58th and with a doubleheader today George Herman should make it an even sixty”. The only problem is Ruth hit number 58 and 59 in the same game (the previously considered September 29 game against the Senators), and it wasn’t a doubleheader. What’s more, the Yankees last double header was on September 18. Unfortunately, there is no way to pinpoint the game Speedy attended because it seems as if Lloyd mixed up the facts. He probably remembered attending a doubleheader against the White Sox, but confused it with Ruth’s history making clout that occurred several days later. 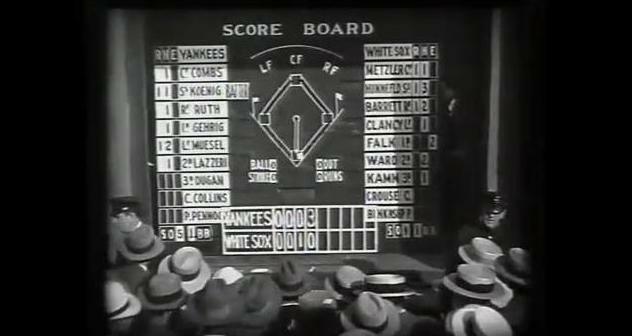 Also, when it came time to film the Score Board scene, Lloyd may not have had access to the actual starting lineups (there was no baseball-reference.com at the time), so instead, he probably just used the two teams’ most common lineups. In other words, Speedy’s day at the ballpark was most likely an amalgamation of Lloyd’s not so exact memories of his time in New York. What other baseball mysteries remain hidden in Hollywood riddles? I think I’ll leave that for the next blog to uncover. Thanks for the info. I came across similar accounts, but the 60th HR doesn’t fit what we see on the field. That doesn’t mean Wright wasn’t there and didn’t film the blast, but the one used in the film doesn’t seem to be #60.
on September 25, 2011 at 4:07 pm | Reply Matt O. Great work on the research! Lloyd and Ruth enter through the gate just to the left of the main gate (the main gate was later called gate 4). As for Ruth’s 60th, there were only 8,000 fans in attendance on that day. BTW, is there any information about when Harold Lloyd filmed the interior Yankee Stadium scenes for ‘The Cameraman’? The billboards almost exactly match those from 1928, and are quite different from those seen in 1927 pics. There is one brief view of the lower LF grandstand, but it doesn’t show enough to determine what stage the extension of the upper levels of the LF grandstand (which started March 15, 1928 and were completed by August 1928) had reached by the time Lloyd filmed in YS. on August 2, 2012 at 12:08 am | Reply Matt O. Just wanted to point out that the shots of Harold Lloyd sitting in the grandstand do not appear to depict Yankee Stadium. The railings and seats do not match those of YS. As these are the only shots in which we see any of the attending fans, the crowd size cannot be used to pinpoint the action taking place on the field (Ruth’s home run). There’s no special reason to think that in either filming or editing any movie there weren’t various ‘takes’ at different at bats or even different days that were later edited together, any more that it would be logical to presume that the many chase scenes in the movie were miraculously in one take or on one day, or even on the same street! Movie editing magic. The baseball action scenes were not scripted, which is why there is every reason to believe they are continuous. Unlike the chase scenes, which involved actors in a fabricated setting, there would be very little reason to splice to together different instances of Babe Ruth rounding the bases after a home run when Lloyd could have simply used what actually happened on the field.